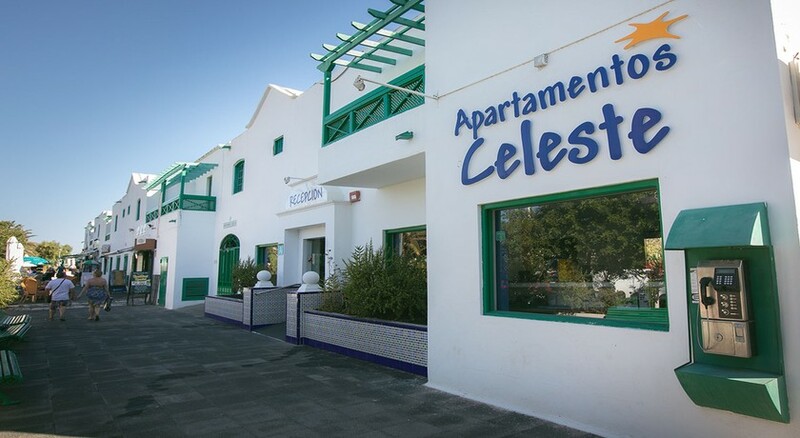 In the heart of Costa Teguise in Lanzarote lies Celeste Apartmentos, an apartment complex with 85 well-furnished rooms. The complex is equipped with one- or two-bedroom apartments, which come with kitchen counters and en-suite bathrooms. All standard amenities such as tea-and-coffee makers, hair dryers, toasters, television sets, Wi-Fi facilities are provided, which ensure a smooth and comfortable stay for the guest. 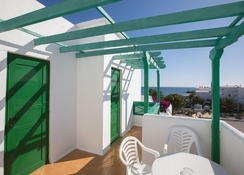 Being located at the very nerve centre of Costa Teguise, the apartment complex provides stunning views of the North Atlantic Ocean and the pale yellow, sandy beaches of the coastal town. 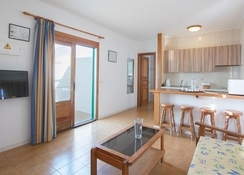 Being located at a distance of just 80 metres from the beach, it is ideal place for a beach holiday. The town provides plenty of opportunities for sport and leisure activities round the year, along with ample scope for relaxation. 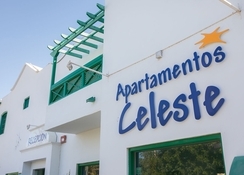 Celeste Apartmentos is located in Costa Teguise in Lanzarote, one of the most beautiful islands in the Canaries. The island, sometimes called the “Mystical Island” is the home to golden, sandy beaches, mighty volcanic mountains, green vineyards and green lagoons. There are a number of tourist-friendly places located near the hotel. The beaches of Costa Teguise are just a short walk away. The Timanfaya National Park is around 35 km away. The picture-perfect beach town of Arrecife is nearly 8.6 km away. And the Costa Teguise Golf Club is around 4.5 km away. Other places such as Playa Blanca and Puerto del Carmen are also easily accessible from the hotel. Simple and comfortable, all the 85 rooms of the hotel come with standard amenities such as satellite television sets, telephone connections, safe deposit boxes, kitchenettes and balconies with stunning views of the beach. The balconies are provided with sun loungers, while all the guests receive cleaning services, linen change and pool towels. The apartment complex is self-catering in nature. But guests can enjoy a quick meal at one of the many restaurants located nearby. The apartment’s super-friendly staff will be more than happy to guide you regarding meal options. The apartment complex is divided into three blocks, each its own pool and sun bathing area. 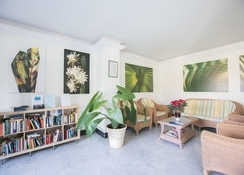 The friendly staff of the hotel will help you to book a car or a bike and explore the hidden treasures of the island. The beach provides a number of water sports such as diving and windsurfing, with instruction facilities for first-timers. There is also a waterpark located just 12 km away from the hotel and a spa and wellness centre just 800 m away. Pharmacies, markets, shops, bars and restaurants are all located quite close to the hotel.